"A Website Archive by Don"
FROM THE WESTYORKWRESTLINGALUMNI.COM WEBMASTER - DON LEHMAN! YAIAA Team 07-08 Wrestling Standings - CLICK HERE! Assistant Coaches - Wade Ginter & Justin Wilkins. West York High School - 15pts. (No Medalists). ° West York/Eastern Wrestling Match Photo's Here! ▪ Results West York HS - Team (14th Place). John Morelli 8th @ 152lbs. WY's Dillon Schwartzer places 7th @ Governor Mifflin (far right). 130 - Dillon Schwartzer (WY) dec. Matthew Michaels (Tulpehocken) 8-7. ° West York/Northeastern Wrestling Match Photo's Here! Saturday - January 26, 2008 @ E-Town's Daubert Gym. by Michael Mountz 07' and Jeff Welker!! Nick Clingan (4th), Head Coach Brian Gross. West York's Billy Randt 4th Place Medalist! York High 0, York County Tech 0. ▪ WY Team and Senior Pictures - CLICK HERE! ▪ 2006 Brandywine Heights Bullet Invitational Full Results - CLICK HERE! Mike Mountz is 5th at 171lbs. 12. Palmyra 56, 13. West York 47, 14. Pottstown 41, 15. Southern Lehigh 22. ▪ Chris Gailey scores three falls in the Bullet Invitational! Full Bracket PDF Results - CLICK HERE! by Kevin Drawbaugh of JK Images - CLICK HERE! Red Land, Shippensburg, Susquenita, West York. and Kyle Miller (125LBS.) 6th at Carlisle! * West York was deducted one team point @ 285lbs. *Photos by Kevin Drawbaugh of JK Images - CLICK HERE! Cedar Cliff vs. West York Photos - CLICK HERE! 10. Northeastern (15 pts. ), 11. West York (12 pts. ), 12. York Tech (1 pt.). Michael Mountz, senior (19-14); Nick Michael, senior (11-21); Chris Gailey, senior (26-10). (171lbs.) Aaron Hacker (Dover) pinned Michael Mountz (West York) 1:11. (Hwt.) Chris Gailey (West York) pinned Kevin Kriner (Red Lion) 3:43. ▪ CONGRATULATIONS to West York's Michael Mountz on the $500 scholarship award! 2007 District III Wrestling Hall of Fame! ▪ Carl and John were "3-time" PIAA State Wrestling Qualifiers! were inducted in the DIII Wrestling Hall of Fame! YDR Article - CLICK HERE! ▪ Final 2006-07 Dual Meet Record...(3-10). ▪ West York's Billy Randt and Alex George place 4th! Littlestown Tourney... B. Randt/A. George Podium Photos - CLICK HERE! 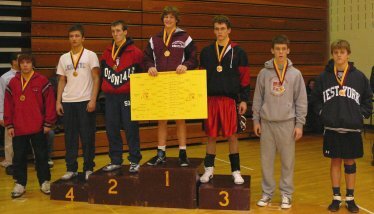 2007 Wilson Junior High Tournament Results - CLICK HERE! West York Jr. High Team places 32nd (52pts.) out of 41 teams. • Results/Podium Pic's - CLICK HERE! WY Blue/White Photos - CLICK HERE! Front Row (L-R) Jeff Sloyer, Dylan Senft, Mathias Smyser, Cody Martin, Kyle Miller. Back Row (L-R) Jose Lopez, Nate Borowski, Chris Gailey, Chris Bello, Michael Mountz. 2006 WEST YORK WRESTLING BANQUET PHOTOS - CLICK HERE! 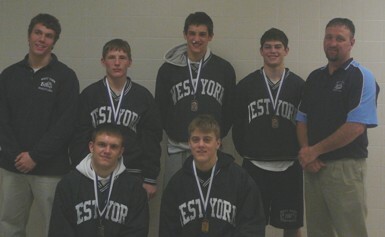 2005-06 West York Wrestling Pictures/Rosters - CLICK HERE! Tourney Results & Podium Photos - CLICK HERE! West York Wrestling Season Recap: CLICK HERE! GFR - Closer To Home! 1972 #1 Voted Team 40-2 WY Run ▪ 4-Timer! NCAA Page "Poland vs. USA-PA"... HERE! but rather... by what one leaves"
2010, 2011, 2012, 2013. All-County Meets - '04, '07, '09, '10. ▪ District III Sectional Mat Photos & Results! ∙ 82, 83, 84, 85, 91, 91, 96, 02, 03, 04, 05, 06, 09, 10, 12 & 13. ∙ West York's 3-Time Sectional Champion's Page ∙ WY PIAA's! West York ▪ 1965, 1972, 1975, 1977, 1978, 1992, 1994, 1999. YDR's YAIAA All-County Wrestling Team Pages - '03, '04, '10. West York's Championship Junior High Mat Team - 1963-64. '74 Wrestling Page...1973-74 Wrestling ∙ CLICK HERE! '75 Wrestling Page...1974-75 Wrestling ∙ CLICK HERE! '76 Wrestling Page...1975-76 Wrestling ∙ CLICK HERE! '77 Wrestling Page...1976-77 Wrestling ∙ CLICK HERE! Click & view ESSC/ESU "All-Time" Wrestling Lettermen! FROM THE WEBMASTER - DON LEHMAN!